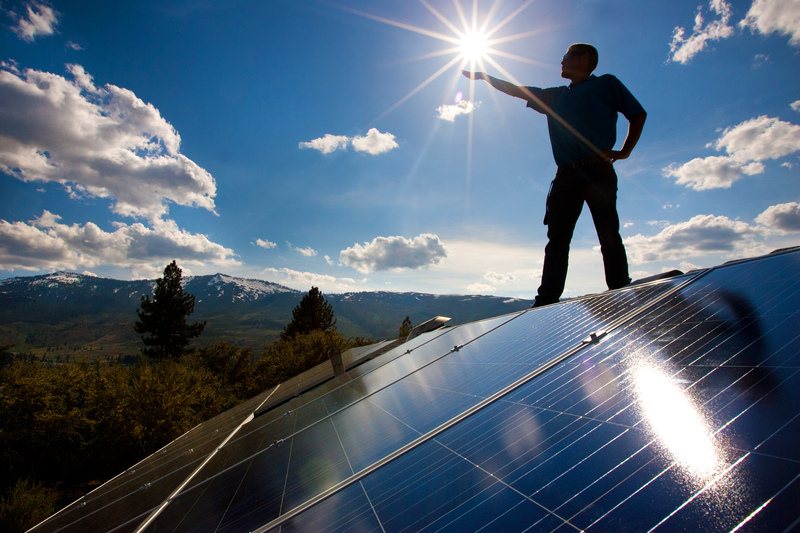 I have been asked many many times how to get started in Solar and renewable energy. If you’re looking to work in the industry, my first answer, understand what the heck you are talking about and just do it. Okay, that many not sound like the best advice, but in my experience thus far most of the Universities don’t know what they heck they are talking about yet when it comes to renewable energy at this point and you’re going to have to do some of your own homework. Sure they can approach it from a big-picture, “Solar energy is good because…” standpoint, but that is pure garbage when it comes to running a clean-energy business. Learn the basics of modules and inverters. Attend one of Bill Brooks’ classes. Read Photovoltaic Systems be James Dunlop. Subscribe to HomePower Magazine, SolarPro, and others. 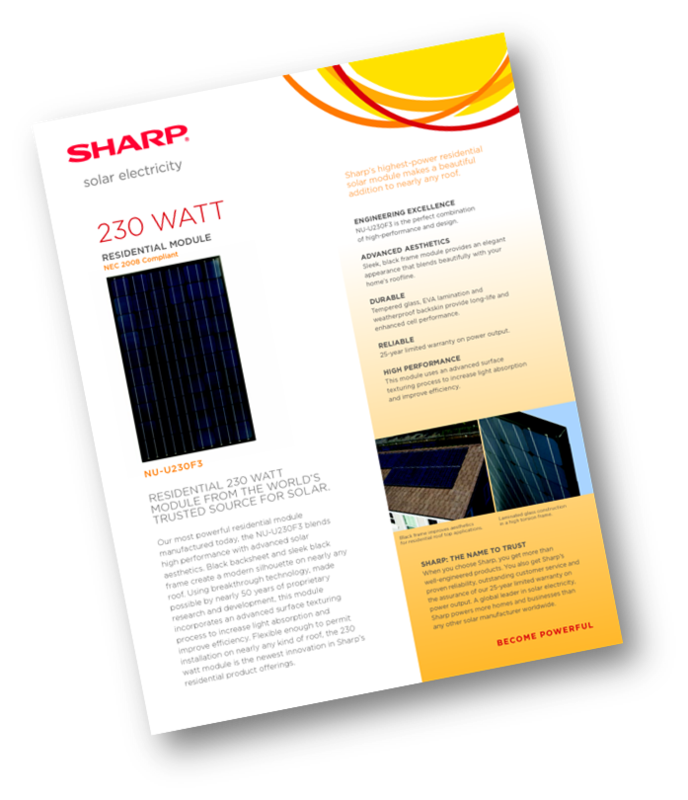 You can easily find information about pv modules by visiting websites of solar veterans such as Sharp Solar, SunPower, and SolarWorld. Common inverters seen today are central (SMA, PV Powered, Fronius) and micro (Enphase). In fact you can get all of this in one place by getting a free catalogue from DC Power Systems or Solar Depot (now the same thing – merged to become the largest distributor in the US), AEE Solar, Focused Energy, or others. Please be careful to avoid homemade and no-name or new solar companies. The industry standard for power performance is 80%+ at 25 years+; if the company has been around for three years, its a little hard to know they’ll still be around in 25. 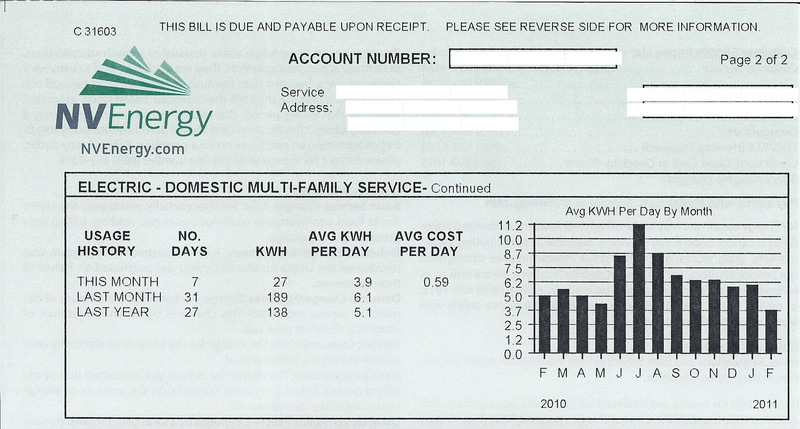 Take an energy bill for your place and size out a system. You will need to learn some back of the napkin calculations for this using NREL RedBook numbers. For example in Reno, Nevada we commonly use 5.96 sun-hours (assuming optimal tilt). That means with my old apartment using around 6.2kWh’s/day would need a 1.04 kW system (assuming no losses) to meet my electricity needs on an average day. There are many arguments about different losses (including wire sizing, inverter, etc) to use, you can add all those individual losses up if you really want, but generally between 0.77 – 0.80 is a good conservative range. If you divide my 1.04 kW by that number (say .8) you would get a 1.3kW system. Make sure you learn how to use PVWatts by NREL. 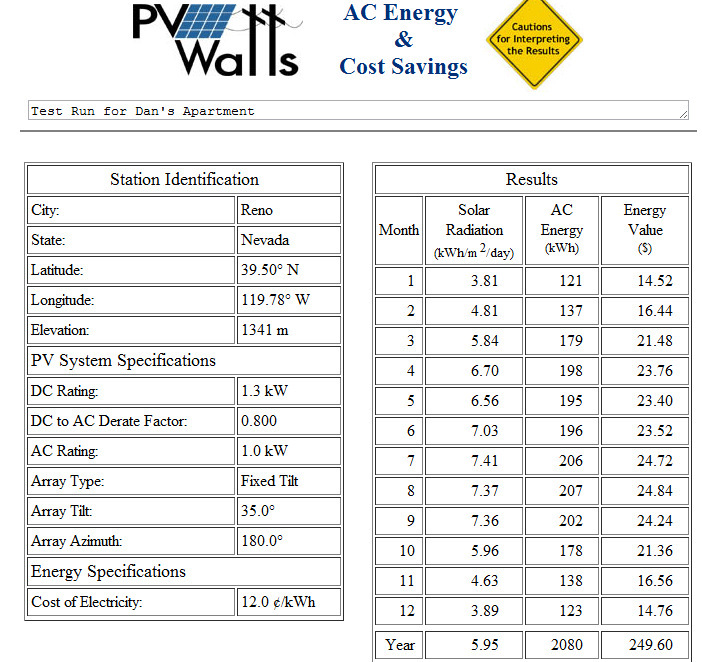 PV Watts gives you great annual performance data for any location in the country using NREL’s climatalogical datasets. If you don’t know how to use Excel, now would be a great time. While you may think people are jumping through the wood-work to install solar for the environmental benefits, this is truly not the case. The hard fact is people only care about the price savings and the people that are widely adopting solar right now are very knowledgable people that have been researching, reading up on it, and running the numbers themselves. While I hate the “pay-back” question, you will get it, and solar is not going to “pay-back” in two years or less for those short-sighted people. Do you ask what the payback is when you do a kitchen remodel or purchase a new car? Solar is an investment, and likely the best one a homeowner can make. It is an investment, and you have to want to do it. Customers have to be shown the economics of it; cash in, savings out. Solar materials prices have been continually falling, but they are likely a little less than they should be right now (Read tariffs on Chinese modules are coming and the market is currently saturated with product which has driven the price down). The weighted average cost to install solar was $4.08/Watt at the end of 2011 (I have seen as low as $3.65/W, but residential can still be in the $5-6/Watt for small systems). NABCEP Certification is not easy; it takes years of industry experience designing and selling systems. Once you reach this level you have proved you are a valueable and honest Photovoltaic Technical Sales Professional. Dan. Great article. You still in the renewable energy / solar business ? Would appreciate your thoughts on this powerful platform that aims to disrupt and decentralise. Power. It’s a short video here. Corey – my apologies for the extreme delay, your comment fell through the cracks on my end. Apologies. I unfortunately am not spending much time in Solar/Renewable Energy any more – mostly dedicated toward investing in Software-as-a-Service (SaaS) businesses. Interesting looking model – is this now a MLM / individual solar referral marketing business?